If you think about it, your website is the online business card for your company. Of course, it’s much more descriptive, but it still conveys important information that helps individuals identify your services and how they can reach you if you are providing what they need. So, going without a website can prove to be detrimental when it comes to bringing in new clients. You are also putting yourself at a disadvantage allowing your competitors to corner the market online. If you are in need of a website or a website redesign, the specialists at Design & Promote can help. For over ten years, the website design experts at Design & Promote have been producing beautifully engaging websites that are sure to please potential customers. Your custom website design will allow users to navigate through your site seamlessly while proudly representing your company and distinctly conveying your marketing message. If you are interested in custom website design in Naperville or if you have any questions about our other services such as digital marketing, give us a call today at 630-995-7109. You can also get in touch with our web design team by filling out the contact form located on this page and we will get back to you shortly. Standing out from the competition is a great way to elevate your business and a custom website will help you achieve just that. At Design & Promote, we are going to deliver a unique website that is one of a kind. It’s going to engage your users and give them a variety of compelling reasons to get in contact with you about your products and services. One of the best factors about your website is the responsive aspect. 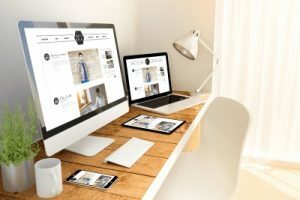 With a responsive website your business can be found on mobile devices and when your site is visited through one of these devices, it will still maintain its original look and feel, while allowing you to take advantage of the growing number of mobile users and searches being conducted from one of these devices. To learn more about our website design services in Naperville or if you would like to request more information about our other services, call us at 630-995-7109 today. Or simply fill out the contact form on this page and we will respond shortly.